This U.S. trooper sword features a leather handle with brass intertwining. The bow and branches connected to the grip are also gold colored. The blade is made of steel and its razor sharp. The silver scabbard features 2 bands and 2 carrying rings. At the tip of the scabbard is a thick drag which also features a gold trim. The back strap features a gold trim that stretches to the pommel and the Quillon. A piece of Civil War History no reenactor or history buff should be without. 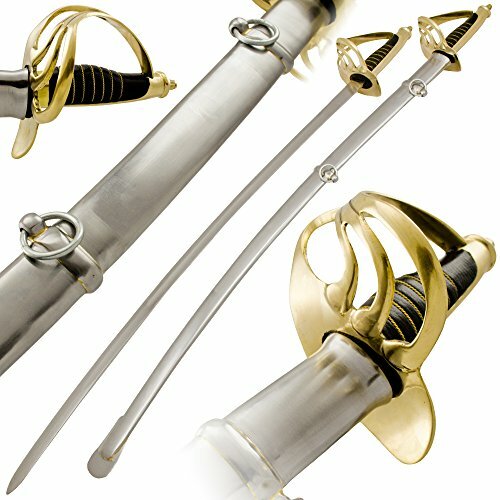 The US Cavalry Trooper Sword was forged with care to be a close replica of the original. In keeping with tradition the Quillon or cross guard of the sword is made of real brass. The scabbard has two eyelet rings, just as the original for attaching to a replica uniform, or for display at home. True to the original, the blade without the scabbard measures 41 inches and has a 35 inch blade. This M1860 saber replica has the gold threaded leather handle to match the original, and is sure to make a great addition to your collection.